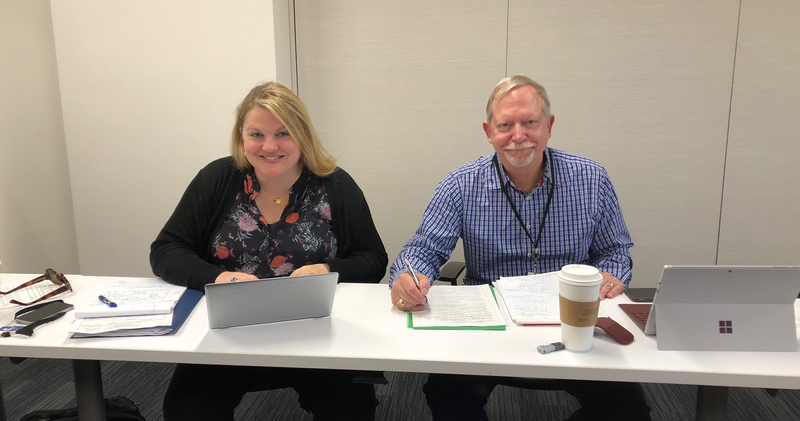 ABA President Bob Carlson and Jaime Hawk, legal strategy director of ACLU Washington in Seattle, working at the ABA’s South Texas Pro Bono Asylum Representation Project. Photo by Marc Davis. Two months ago, then-ABA president Hilarie Bass went to South Texas to see the effects of the Trump administration’s family separation policy. There, she promised that the ABA would not stop working until every family was reunited and every detainee was given the due process they’re legally entitled to. This week, newly installed ABA president Robert Carlson took a step toward fulfilling that promise, traveling to South Texas to do pro bono work for asylum seekers through the ABA’s South Texas Pro Bono Asylum Representation Project. Carlson is part of a delegation of volunteers from the ABA that also includes president-elect Judy Perry Martinez of New Orleans, Louisiana; ABA Commission on Immigration director Meredith Linsky; attorney Jaime Hawk of Seattle; and attorney Jennifer Bailey of Maine. All five have been working for ProBAR all week, helping immigrants detained at the Port Isabel Detention Center lay the groundwork for their cases. Most are claiming asylum, Carlson says, so his job is to understand why they fled their home countries and what kind of cases they might have. If they haven’t yet had a credible fear interview, the first step toward asylum, the volunteers tried to prepare them; for those who have had the interview, the volunteers asked what was said. Carlson says the need is great. ProBAR is expecting to serve about 13,000 unaccompanied minors in 2018, up from about 11,000 the year before. That doesn’t count the adults the project also serves. Carlson planned to step aside from the pro bono work Thursday in order to visit the federal courthouse in McAllen, Texas, to observe criminal prosecutions of immigrants there and visit a shelter for unaccompanied minor immigrants. Carlson urges other lawyers to volunteer their time if they can. ProBAR is in particular need of Spanish-speaking attorneys, as well as lawyers with immigration experience who can stay in South Texas for a month. However, he says, volunteers don’t necessarily have to leave home to help. Because many of the asylum-seekers ProBAR helps will ultimately go to live with relatives in other parts of the country, pro bono work will be needed around the United States. Interested attorneys can find volunteer opportunities through the ABA or through an ABA partner, the Immigration Advocates Network. ProBAR is also adding considerable staff in Texas, seeking Spanish-speaking lawyers and paralegals with experience or interest in immigration law. Updated at 1:02 p.m. to clarify Carlson’s travel plans. Accused dine-and-dash dater is charged with 10 felonies; was the conduct extortion? Posted by Contributor on Aug 31, 2018 in Elder Care | Comments Off on Accused dine-and-dash dater is charged with 10 felonies; was the conduct extortion? A man known as the dine-and-dash dater has been charged with 10 felonies for allegedly taking financial advantage of women he mostly met on dating apps and websites. The suspect is 45-year-old Paul Guadalupe Gonzales. 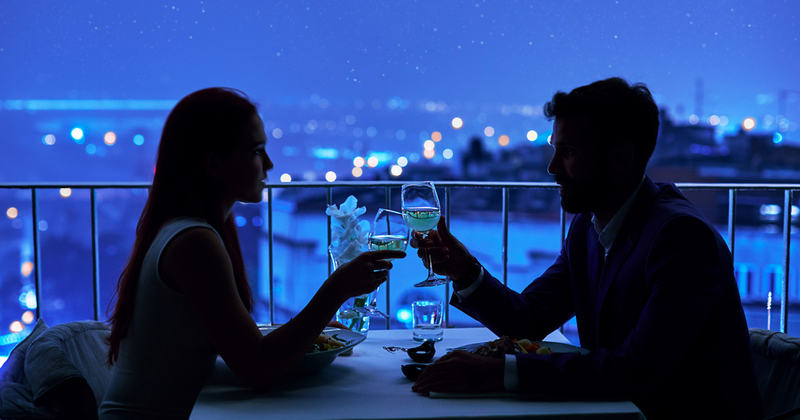 He is accused of going to dinner with women, consuming pricey meals, and then disappearing without paying any of the bill. Eight women paid the entire tab, while in two other instances the restaurants picked up the check, according to a press release by the Los Angeles County District Attorney’s office. USA Today and the Washington Post have coverage. Gonzales is charged with seven counts of extortion, two counts of attempted extortion and one count of grand theft, all felonies that stem from the women’s complaints, according to the felony complaint. He pleaded not guilty Monday. He is also charged with misdemeanor counts of defrauding an innkeeper and petty theft from restaurants that paid the check, and petty theft for allegedly leaving a hair salon without paying. One woman told the Washington Post that Gonzales ordered chicken, four lobster tails, expensive wine and dessert at a Los Angeles restaurant in 2016. Then he excused himself to make a phone call and never returned. The woman, Marjorie Moon, had met Gonzales on the Plenty of Fish website. The excuses varied, according to the Washington Post and CBS Los Angeles. Sometimes he said he had to use the bathroom or get his phone charger. One woman told CBS that Gonzales left after she didn’t reciprocate his advances. Prosecutors say Gonzales collectively defrauded the women out of more than $950. California law defines extortion as obtaining property from another through wrongful use of force or fear. Fear can be induced by a threat to expose or impute to the victim “any deformity, disgrace or crime.” Grand theft is defined as the theft of property worth more than $950. The felony complaint does not explain why the alleged conduct amounted to extortion. It merely alleges that Gonzales extorted property “by means of force and threat” from the women. Loyola at Los Angeles law professor Laurie Levenson says the basis for the extortion charges isn’t clear. Sometimes in these types of cases, there is a threat to embarrass a victim who balks at a person’s demands or who wants to complain to authorities. The maximum penalty for the charges is 13 years in prison. Updated: Citing fears of fraud, the State Department has denied or revoked passports to hundreds and possibly thousands of Hispanics whose birth certificates indicate they were born in the United States. Some people with U.S. birth certificates are being detained and entered into deportation proceedings, while others have had their passports revoked as they tried to re-enter the United States from Mexico, the Washington Post reports. The government is asking the targeted applicants to provide additional proof of U.S. birth, such as evidence of the mother’s prenatal care, a baptismal certificate or a rental agreement showing a U.S. address, according to the article. The crackdown stems from fraud that began in the 1950s by some midwives and physicians along the Southern border who listed U.S. births for babies born in Mexico. But the use of midwives was common in the region, and some babies they delivered were born on U.S. soil. The State Department acknowledges it is demanding additional documentation from some passport applicants to show they were born in the United States. The demand is made to people whose birth certificates were “filed by a midwife or other birth attendant suspected of having engaged in fraudulent activities, as well as applicants who have both a U.S. and foreign birth certificate,” a department spokesperson said. The George W. Bush and Barack Obama administrations had also denied passports to some people delivered by midwives, but the practice changed after the 2009 settlement of a lawsuit filed by the American Civil Liberties Union and other organizations. After the election of President Donald Trump, however, the number of passports denied or revoked has been skyrocketing, according to Houston lawyer Jennifer Correro. Another lawyer, Jaime Diez of Brownsville, Texas, told the Post that he has had about 20 clients who were placed in immigration detention despite their U.S. birth certificates. 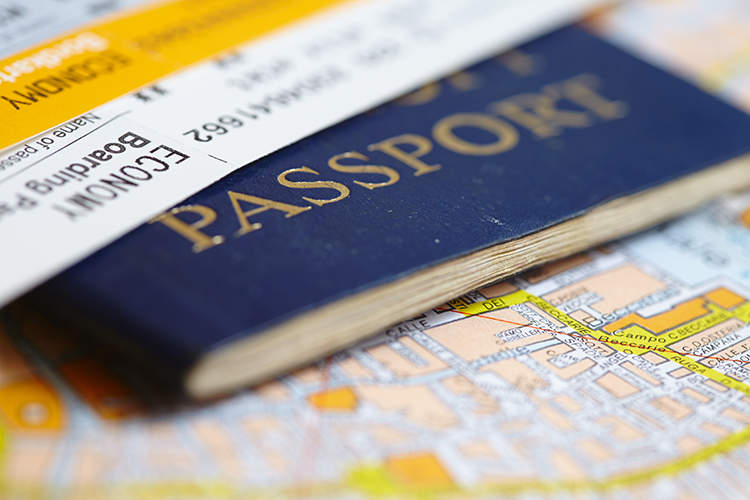 Hundreds of other clients have had passports denied or revoked. Lee Gelernt, deputy director of the ACLU Immigrants’ Rights Project, said in a press release that the organization is “investigating and exploring possible legal steps” following the Washington Post report. “The Trump administration’s attempt to deny passports to long-term American residents living in border areas is just one more inhumane act in a series of unlawful actions,” Gerlent said. Updated at 3:25 p.m. to add ACLU reaction. For far too many Americans, however, equal access to justice remains more of a promise than a practice, particularly in the civil justice system where the right to counsel is not guaranteed. Most people who cannot afford to hire a lawyer cannot secure free or even low-cost legal assistance. They are on their own in a system designed by lawyers for lawyers. This has grave consequences for them and for the judges and court administrators charged with maintaining the orderly functioning of our court system. • Approximately 60 million Americans qualify for LSC-funded civil legal aid because their incomes are at or below 125 percent of the federal poverty guideline—currently $15,075 for an individual and $30,750 for a family of four. • Seventy-one percent of low-income households experienced at least one civil legal problem in the past year. • One in four low-income households experienced six or more civil legal problems, including 67 percent of households with survivors of domestic violence or sexual assault. • Eighty-six percent of the civil legal problems faced by low-income Americans in a given year receive inadequate or no legal help. • Low-income Americans seek legal help for only 20 percent of their civil legal problems, and are more likely to seek help for problems that seem more obviously legal, like civil legal problems related to children and custody (48 percent) and wills and estates (39 percent). Forcing litigants to represent themselves compromises their access to justice and burdens the court system. Cases involving self-represented parties frequently reach the courts as litigation, when—had counsel been involved—they would have been resolved long before that point. And once they are in court, they take up significantly more time, as judges and clerks must explain information commonly understood by lawyers. The resulting delays affect everyone who needs access to the court system. The LSC, the ABA, and other stakeholders in the legal community are doing their best to narrow this justice gap by developing innovative technology, encouraging and supporting pro bono participation by the private bar, and undertaking other initiatives. These are useful, but the country’s civil legal aid network remains chronically underfunded from all sources, particularly from the federal government. The current administration, in fact, has the last two years called for defunding LSC completely, but Congress has resisted this call, and last year increased LSC’s funding by $25 million to $410 million. That figure is still well below what is needed and does not even match the $420 million appropriated by Congress in 2010. From 2007 to 2016, funding per eligible person decreased from $7.54 to $5.85, and at its current level, funding for LSC is less than one-ten-thousandth of the federal budget. It is no wonder that the World Justice Project ranks the United States dead last (36th out of 36th) among high-income countries on the question of whether people can access and afford civil justice. Robert J. Grey Jr., a senior counsel with Hunton Andrews Kurth in Richmond, Virginia, retired from the active practice of law in March 2016. From 1998 to 2002 he served as chair of the ABA’s House of Delegates and was the first African-American to be an officer of the association. 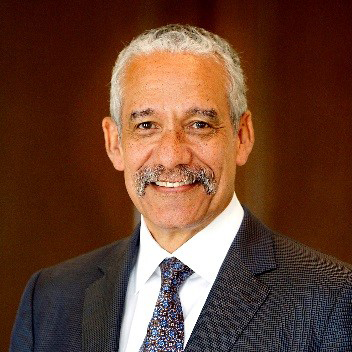 He was elected president of the ABA in 2004, the second African-American to hold the position. In 2009, Mr. Grey was appointed by President Barack Obama, and confirmed by the Senate, to serve on the Board of the Legal Services Corp. In 2012, Grey was elected president of the Leadership Council on Legal Diversity. Judge rules Johnny Depp can void unwritten contract with lawyer; is ‘handshake culture’ at risk? Posted by Contributor on Aug 31, 2018 in Elder Care | Comments Off on Judge rules Johnny Depp can void unwritten contract with lawyer; is ‘handshake culture’ at risk? A Los Angeles judge ruled on Tuesday that actor Johnny Depp can void an oral contract with his former lawyer because California law requires contingency agreements to be put in writing. Judge Terry Green said Depp’s 1999 oral agreement with lawyer Jacob Bloom is a voidable contingency-fee agreement because it bases payment on a percentage of Depp’s earnings and is contingent on Depp’s success, report the Wall Street Journal, Courthouse News Service, the Am Law Litigation Daily and the Hollywood Reporter. According to the Hollywood Reporter, it has been unclear whether percentage fees for transactional legal services are considered contingent fees. Lawyers for Bloom’s law firm, Bloom Hergott Diemer, had argued contingent fees are different than percentage fees because they involve a risk of failure. Depp maintains that Bloom and his law firm were paid more than $30 million under an invalid oral agreement, even as they mismanaged his finances and engaged in self-dealing. Bloom, on the other hand, claims the contract is valid and Depp owes money for unpaid legal bills. Bloom also claims Depp ratified the agreement by continuing to accept legal services after settling a dispute with business managers over their failure to use written agreements with Bloom and other professionals. But Green said the oral contract can’t be ratified unless there is a written agreement, signed by a client who knew of the option to void the oral contract. Green’s decision “is prompting a reassessment of the handshake-deal culture” that still endures in Hollywood, according to the Wall Street Journal. 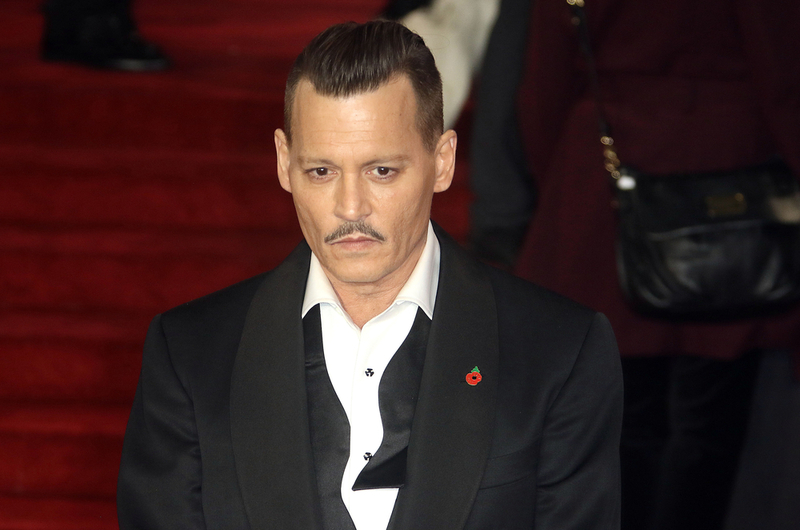 Depp’s lawyer, Adam Waldman, told the Wall Street Journal and Courthouse News Service that the decision will likely create major change throughout the entertainment industry. Depp wants the return of all the legal fees he paid. But California law allows Bloom to be paid reasonable compensation for his time; he claims he has spent thousands of hours doing legal work for Depp.